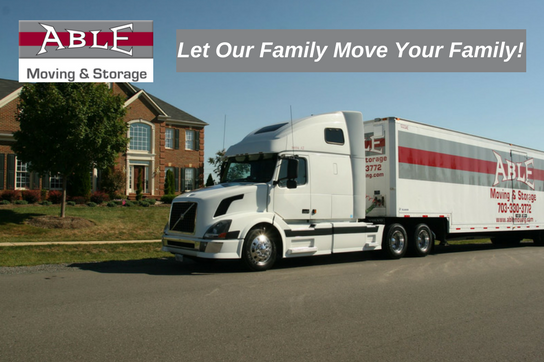 Moving and storage help is readily available to the residents of Northern VA. When deciding on a moving company to handle your relocation, it might be wise to consider a full-service moving company. A full-service mover can handle any unexpected issue and is prepared for just about anything. Able Moving & Storage has complete professional moving services, offering local, long distance, and international moves as well as affordable packing and storage solutions. There are a lot of professional moving services in Northern VA, but there is only one who is Able. If you’re worried about picking the right moving company, make sure you read past reviews before you make any decisions. This is the absolute best way to reduce your chances of selecting an unqualified mover. Whether your home or office is located in Northern, Virginia, if you need moving help, Able Moving & Storage is the company for you. We dedicate ourselves to giving our customers the absolute best quality service. If you’re searching for a company that can pack up, pick up, and move your home or office in the blink of an eye, call Able. Our moving and storage services date back to 1987 — that’s over 30 years of experience! Everything we’ve completed in the past three decades has helped us create a much better moving experience for you. Able Moving & Storage is your local Northern Virginia moving company if you need a service that’s affordable, dependable, and reliable. Do you need to use our Northern VA moving trucks for your upcoming long distance move? When it comes to long distance moves, there are a lot of cheap movers who would love to earn your business. However, the last thing you want is an unqualified mover handling your valuables. Able Moving & Storage has over 200 trained employees, and we do not use day help to complete our moves. All of the professional movers at Able are employees and will treat you and your home like family. If you’re looking for a company to trust with your cross country relocation, give us a call. Our employees are full of helpful and useful information to help you save time and money on your next move. Able Moving & Storage is a fully independent moving company. Being an independent professional moving company comes with many advantages, like our flexible moving rates. When relocating to or from Northern Virginia, you’ll receive moving quotes of all shapes and prices. Over the past 30 years of being in business, we’ve always offered the most competitive moving costs. We knew right from the beginning that by taking care of the customer, everything else will fall into place. When comparing other moving companies to Able, you might find some that are cheaper, but you won’t find any that are a better value. Request a free, no obligation moving quote and let our family move your family! Packing and unpacking are by far one of the most tedious parts of the entire moving process. However, it doesn’t have to be that way. Able Moving & Storage is a full-service mover; we handle everything. When you hire Able for your local move to or from Northern VA, we take care of packing, moving, storing, delivering, and even unpacking your moving boxes. We provide a completely ‘done for you’ solution to our customers who want that level of service. Alternately, we also have affordable packing supplies if you prefer to handle this task on your own. Call us today if you need moving boxes or if you’d like our team of expert packers to make quick work of securely packing your items. After moving Northern Virginia for the past 30 years, we’ve learned all there is to learn about the area. Our moving services are designed to give home and business owners a completely stress-free solution to relocating their belongings. If you’re ready to experience what Able Moving & Storage can do for you, call us today or request a free quote. Remember, we can handle all of your local, long distance, and international moving needs in and around Northern VA!